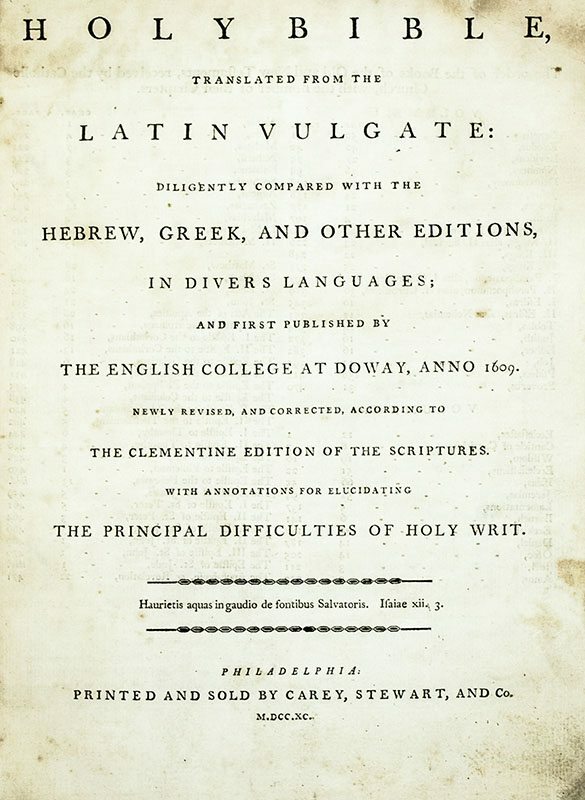 The Holy Bible, Translated from the Latin Vulgate: Diligently Compared with the Hebrew, Greek, and Other Editions, in Divers Languages; and First Published by The English College at Doway, Anno 1609. Newly Revised, and Corrected, According to the Clementine Edition of the Scriptures. 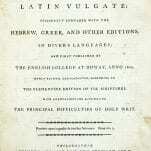 With Annotations for Elucidating the Principal Difficulties of Holy Writ. Philadelphia: Carey, Stewart, and Co, 1790. 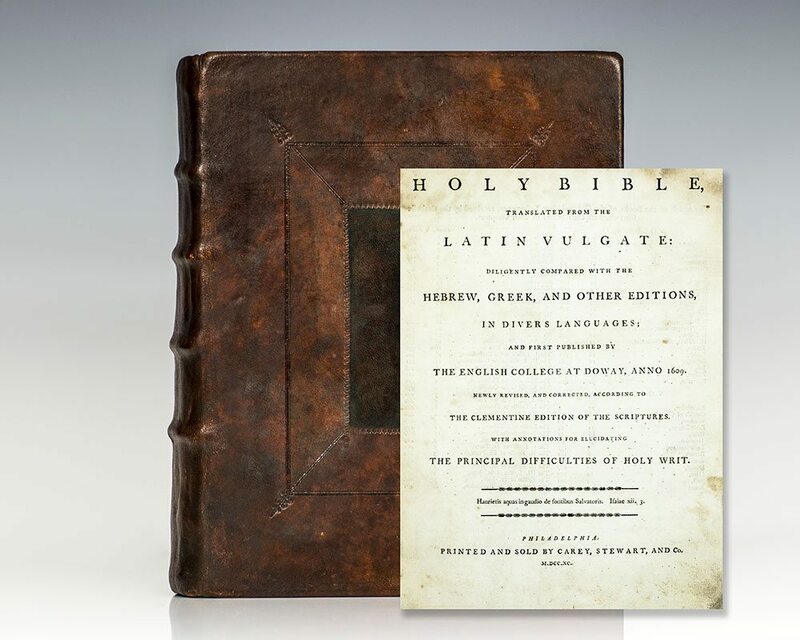 First edition of the first Catholic Bible printed in America, “the rarest of them all” and the first quarto edition Bible printed in America. Quarto, bound in full calf. Two volumes bound in one, title page to volume one, not title page of volume two as issued, two leaves of subscribers’ names. In very good condition with some of the usual toning to the text. An exceptionally rare work, most desirable. 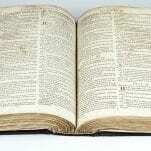 The first Catholic version of the Bible in the United States. In spite of the small Catholic population in the United States, printer Mathew Carey undertook the endeavor by soliciting subscribers. He needed 400 and succeeded in getting 491. A manuscript leaf on the rear pastedown provides greater detail on the venture: "It appears from an advertisement published in Carey and Stewart's Magazine 1789 that the subscription price of the Doway Bible was six Spanish milled Dollars, three paid on subscribing and three when the book was delivered. They also advertised that whereas some gentlemen thought the price rather high as compared with the Protestant version then offered by Collins at Four Dollars. It was necessary to note that Collins conditioned for an edition of 3000 copies, whereas Carey and Stewart were to put this Doway Bible to press whenever the subscription came up to 400 copies. - G.J. Philadelphia Oct 27, 1870" An Irishman with little formal education , but a fine facility with languages, Carey had long been a champion for liberty. At 19 he issued a pamphlet in support of Dublin's apprentices which forced him into exile in Paris, where he met and became friends with Benjamin Franklin and the Marquis de Lafayette. After a return to Dublin, time in prison and an escape from Ireland disguised as a woman, he found himself in Philadelphia, nearly penniless. A loan of $400 from Lafayette provided his salvation. It was a debt that as an eventually successful printer and publisher, Carey was able to repay when the Marquis was himself in dire financial straits. Carey's means were still very modest when he issued this work and it is most commonly found, if at all, in a much more humble binding of plain sheep, as he was unable to secure credit from binders. 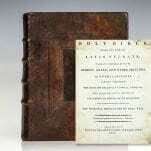 Darlow & Moule 949(a); Evans 22349; Herbert 1343; Rumball-Petre, America's First Bibles pp. 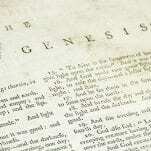 97-110 ("Carey's first Catholic Bible printed in America in 1790, the rarest of them all"); Sabin 5166.